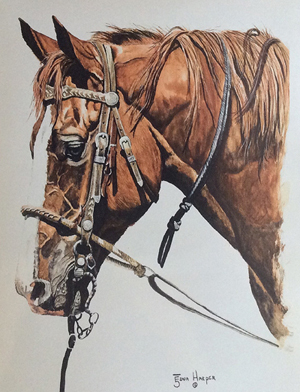 Edna Harper grew up in a world of cowboys, horses, western tack, and broad mountain vistas under a big sky this is reflected in the images she paints and draws in her oils, watercolors, pastels, and pencil drawings. One of six daughters of a western New Mexico ranch family, Edna lived in Quemado, NM, as a child. There she absorbed the imagery of the West while she taught herself to draw and paint. Edna was encouraged by family and friends to enter her work in the local county fair. To her surprise, she won many awards including best of show. That was in 1980, she has been entering shows and winning awards ever since. Edna also learned the art of silversmithing from Frances Begay a noted silversmith. Edna incorporated her talent as a western artist into silver in which she designs and hand makes each piece, applying a technique used by the Hopi Indians called hand cut overlay. She uses sterling silver and 14 kt gold, each piece is signed with her brand, Bar E Five. She has received major recognition for the quality and craftsmanship of her unique jewelry.